We all know about Thor‘s magic hammer, but it’s not the only one to appear in mythology. It was actually while reading through a page on the translation of Final Fantasy IV that I came across a mention of the Uchide-no-Kozuchi. While this name literally translates to “striking-out hammer,” it is sometimes called a Lucky Mallet in English. Its exact powers seem to differ from one source to another, but it always has magical properties that can be accessed by swinging the hammer. Sometimes it’s said to provide wealth, and other times just to grant wishes in general. One tale about it claims that anything produced by it will disappear at the tolling of a bell, which sounds pretty inconvenient. 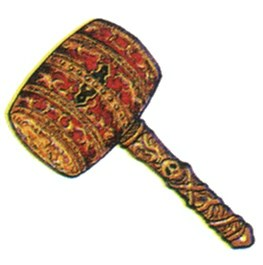 Daikoku-ten, one of the Seven Lucky Gods, is said to carry one of these hammers. 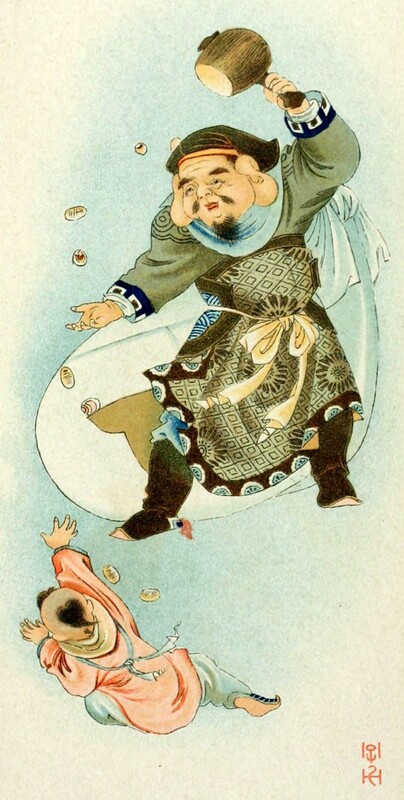 The mallet features prominently in the Japanese fairy tale of Issun-boshi, or “Inch-Tall Boy.” Like Tom Thumb in European folklore, Issun-boshi is born incredibly tiny but with a heroic personality. He sets off into the world with a rice bowl for a boat, a chopstick for an oar, and a needle for a sword. When he faces a group of ogres who are threatening a princess, he attacks one with his needle-sword, and it promptly swallows him. He is able to fight the monster from the inside, however, eventually killing it. He then finds the magic mallet, which was in the possession of an ogre. Apparently earlier tales also said that ogres carried these hammers. 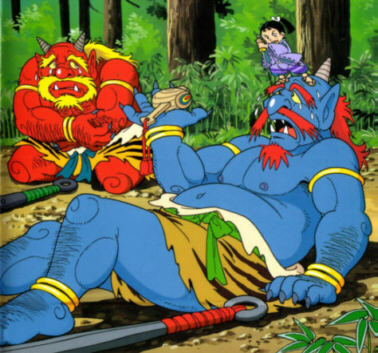 In some versions of the fairy tale, the princess uses the hammer to enlarge Issun-boshi to normal human size, and the two of them are married. Later parodies of the story sometimes had Issun-boshi and his wife hit each other with the mallet when they fought, eventually both shrinking each other down to nothing. The idea of the hammer being used to make people grow or shrink apparently caught on in Japanese culture, and it’s used for this purpose in several video games. In the Final Fantasy series, it can bring a party member who was shrunk down to tiny size by a monster’s spell back to normal. 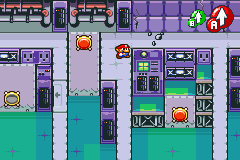 The Midge Mallet in Secret of Mana can make a character either shrink or grow, as can Luigi’s hammer in Mario and Luigi: Superstar Saga. And in Okami, a game I actually own but haven’t yet played, the protagonist can use the mallet to shrink himself down to Issun-boshi’s size and enter the Emperor’s body. The Silver Hammer in Ruth Plumly Thompson’s Handy Mandy in Oz also came to mind when I read about the Uchide-no-Kozuki. This hammer summons an elf who obeys the commands of whoever strikes it against something, and is considered by the Wizard of Wutz to be the second most powerful magical talisman in Oz after the Magic Belt. Wikipedia mentions “Aladdin’s mallet” as a variation on the Uchide-no-Kozuki, but I can’t find any other information in English about this. Is there a story where the hammer summons a wish-granting being, and if so would Thompson have been aware of it? This entry was posted in Characters, Fairy Tales, Final Fantasy, Japanese, Magic, Magic Items, Mana/Seiken Densetsu, Mario, Monsters, Mythology, Oz, Oz Authors, Ruth Plumly Thompson, Video Games and tagged daikoku-ten, elves, final fantasy iv, hammers, handy mandy in oz, himself the elf, issun-boshi, lucky mallet, luigi mario, mario and luigi: superstar saga, midge mallet, ogres, okami, oni, secret of mana, seven lucky gods, silver hammer, tom thumb, uchide-no-kozuchi. Bookmark the permalink.